Damien Chazelle’s quite extraordinary second feature, Whiplash (winner of the Audience Award and Grand Jury Prize at Sundance this year) presents a brutal exploration into the muddy, bloody line between creativity and destruction. Whiplash is an intense, visceral viewing experience; a film you will watch not only with your eyes and ears but also with your stomach. It will tie your gut into multiple knots as you watch a young jazz drummer discover just how far into the abyss he’s willing to wade to perfect his art. That drummer is Andrew Neyman (Miles Teller), a 19-year-old student at the most prestigious music school in the United States, the fictitious New York Shaffer Conservatory. Jazz is his thing and he knows that to be the best he needs to be a part of Terence Fletcher’s ensemble. The great J.K. Simmons (Oz, Juno, Spider-Man) plays Fletcher with an obsessive drive, like a drill sergeant, dishing out ruthless musical instruction with personal insults on the side. Teller, so engaging, confident and warm in The Spectacular Now (2013), here reveals new layers of skill. Apart from what looks to my untrained eyes as some solid drumming (he actually plays), Teller has a screen presence that matches Simmons ferocity note for note. The destructive battle that plays out between these two men is relentless from the start when Fletcher handpicks Andrew from a lower grade ensemble that comically can’t seem to play in time. But he’s not anointed and set on an easy path by this choice. Rather Andrew’s entry into Fletcher’s studio jazz band and the dark, monastic space of the rehearsal room, is a baptism by fire with ritual acts of emotional, physical and verbal violence so extreme and confronting (for Andrew and for us) that you wonder where else Chazelle’s film can go (at Sundance the film was known as “Full Metal Juilliard”) from here. But as we soon discover, this is just the start. Fletcher’s cruelty knows no limits. Gently seducing two seemingly innocuous pieces of personal information from Andrew during their first ‘real’ conversation – that his mother left when he was young and that his father is a failed writer who teaches high school – Fletcher has the ammunition he needs. He has Andrew right where he wants him, like a puppet on a string, ready to dance for him. Chazelle’s screenplay is informed by his own experiences with a bullying musical instructor. Whiplash is a film about the things that drive a person to succeed and its main inquiry seems to be how far is too far to push another person towards this success. Fletcher is a teacher who believes that the most dangerous words you can tell some one is “good job” – he’s interested in pushing his students towards greatness by pushing them “beyond what’s expected of them”, but mostly it seems he just pushes them to the edge of insanity. His methods – and his motives for that matter – are questionable at best. But the more interesting problem Whiplash poses, for me, is what is revealed in a person’s willingness to submit to these extremes. And I like that Whiplash poses this question and doesn’t really provide us with an easy answer. No argument solid enough could ever be mounted to suggest that Andrew deserves what Fletcher doles out. But an argument can be made that he is, to a certain extent, a complicit and willing participant in it. And this, I think, is what makes Whiplash a really fascinating film. Andrew wants to be one of the greatest jazz drummers that ever lives, the next Buddy Rich, who he idolizes; he would rather burn brightly for even a short time, like Charlie Parker, and be remembered for his brilliance than endure a life of mediocrity and die unknown. He is deeply ambitious, willing to sacrifice everything, including a burgeoning romance with a sweet, shy student named Nicole (Melissa Benoist) who operates the snack stand at the revival cinema he frequents with his dad. Like many creative people, he’s learned to defend his chosen career path ferociously, as valid and worthy of pursuing, against people who just don’t seem to understand, as a key scene around the dinner table with his extended family reveals. Fletcher can smell this drive (Andrew’s strength and his weakness) and exploits it. He’s part good and part bad for Andrew and a destructive urge pushes the men together. This urge is embodied in a number of stunningly tense sequences throughout Whiplash, including its most unforgettable sequence, its finale, which I won’t tarnish for you here. The first, however, is a three-way battle of the sticks around the middle point of the film. Fletcher pits Andrew against two other drummers to see which of them he will take to the next competition by testing their ability to play the great composition ‘Caravan’ most competently in his tempo. The contest goes on for hours, into the night. Each drummer drenched in each other’s sweat; the kit splattered with each man’s blood. It’s a sequence of visceral gore, edited both on and outside the beat, the pressure building, excruciatingly. And by the battle’s end, when Andrew emerges into the wee small hours of the morning, his fingers bloodied and his expression bruised, he resembles a prizefighter who survived three rounds in the boxing ring. Not long after, Chazelle pushes Andrew to the edge again. He encounters a series of misfortunes as he tries to arrive, on time, for the competition in which he has been feted to play ‘Caravan.’ The scene is exaggerated; in many ways what transpires on the road to the venue is extreme, but deliberate to strengthen our understanding of Andrew’s commitment. 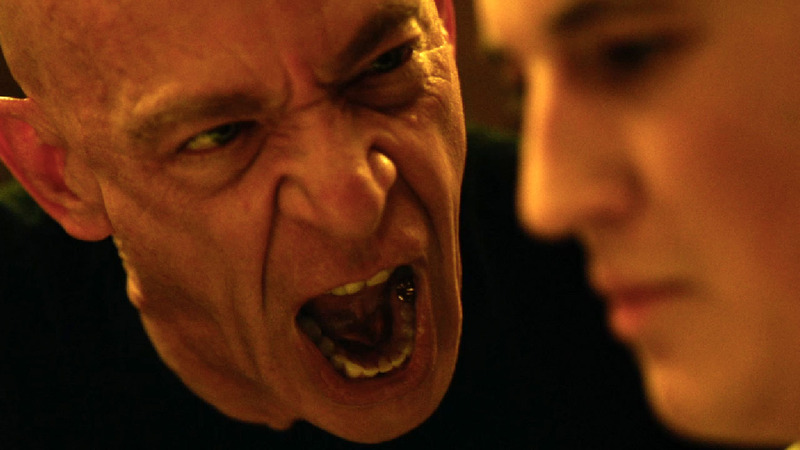 These scenes, without giving away too much, are the zenith of Whiplash’s frenetic energy. And when Andrew arrives only seconds before the band is ready to play and Fletcher sees the state he is in (bloodied and bruised again) and lets him commence playing anyway, each man’s destructive impulse is taken to its logical conclusion. In both these sequences, horror and excitement are intertwined. They are exemplary of the knife-edge ambivalence I experienced throughout much of Whiplash, and why, for the most part, my stomach couldn’t untie itself. I felt both an affinity with Andrew’s passion and a sense of frustration with his resolve. As the film headed toward its brilliant conclusion I also experienced conflicted feelings towards Fletcher. 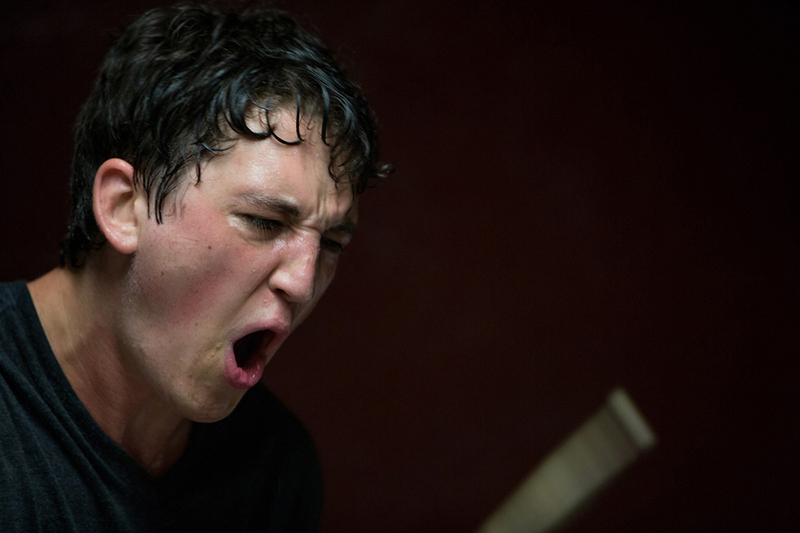 Whiplash makes us feel great, elated and ecstatic but also bad and bruised and let down. By the film’s end it is possible to say that Andrew and Fletcher are cut from the same cloth, locked in a symbiotic relationship. For the length of the film, at least, one cannot live without the other. That this film positions you in an unstable identification with both protagonist and antagonist is one of its great strengths and I think one of the elements that make it a film you will carry with you for some time after the curtains close. There is some truth in Richard Brody’s argument that Whiplash gets jazz wrong, that it seems to strip the joy out of playing music (although I was certainly tapping my fingers and toes throughout) and removes any sense that jazz is about collaboration and the collective pursuit of greatness (‘Getting Jazz Right in the Movies’ The New Yorker October 13, 2014). But there is something more going on here. In the end, Whiplash is probably not even really a film about jazz. It is a film about power, about two very specific beasts, certainly not designed to be exemplary of the entire jazz fraternity (and fraternity it remains, because quite apart from the argument some critics have mounted against Whiplash for its ‘race problem’ a similar argument could be mounted with regard to its ‘woman problem’ if you felt so inclined). In cinema, creativity is often presented as existing on the fringes or on the edge of sanity. Artistic mythology imagines writers as tormented drunks; painters, addicted to drugs or other vices. Musicians, like Charlie Parker (whose legend is a compelling presence in Chazelle’s film), prone to self-destruction. This forms the dominant narrative of creativity in our culture – that it takes courage, but that it comes at a price. Something has to be lost, so that something else can be gained. Sometimes, even, a pact is made with the devil. Creating anything takes blood, sweat and tears. And it’s not always fun or joyous or spontaneous and easy. That’s why I think a review like Richard Brody’s is being disingenuous with us too; because while jazz is magical and filled with light and life, there is also darkness and struggle in the creation of anything beautiful that lasts. This is true of any creative pursuit. Writers, on film, have a long history, but it’s difficult to make compelling viewing out of the torment it might take to write that one perfect sentence. But playing the drums – an instrument that is so physical and dynamic – allows for a powerful visual language of destructive creativity. We can better understand the blood, sweat and tears it takes to make art here because we can actually see each of these and absorb them into our own experience of the film. It makes sense to me that Chazelle gave Teller a copy of Raging Bull to watch before they started filming. 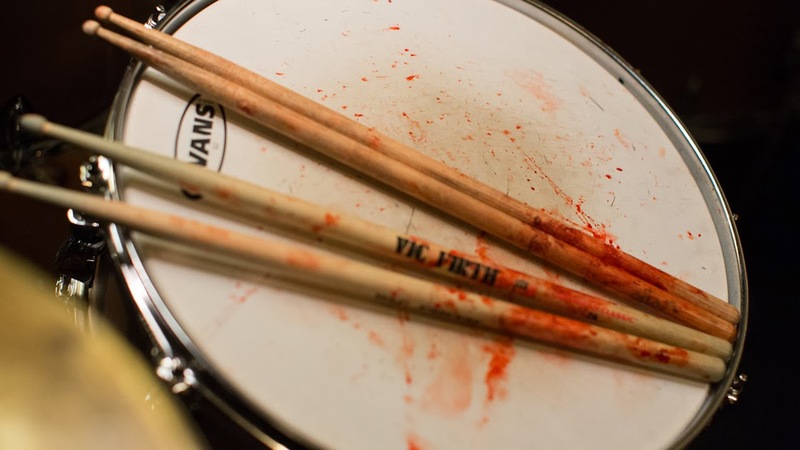 Like Scorsese’s masterpiece, Whiplash is an often uncomfortable assault on our senses and nervous system. But in boxing, as in art, the fruits of self-destruction can sometimes be quite beautiful to watch. By the film’s conclusion, Andrew has been crushed and pushed to the limits of his sanity, but he’s also achieved what Kurt Vonnegut defined as the essence of a creative life – a willingness to jump off cliffs and develop his wings on the way down. And as he taps out that final solo, he’s figured out how to fly. Wonderful review. That final sequence is truly one for the ages. It’s something else. Someone I follow on Twitter commented at her disappointment that she’ll never get to see that final sequence for the first time again. I understand that feeling. Keep hearing so many wonderful things about this one. Looking forward to seeing it when it’s released in the UK! Obviously, I highly recommend it. I look forward to hearing your thoughts.